Wild-caught Alaskan fish deserves the perfect beverage pairing to complement its superior flavor, freshness, and texture. If you’re up for the task — and it’s easier than you think — get ready to go beyond white wine and consider how beers, cocktails, mocktails, and even red wine can bring out the most in your fish. Salmon, halibut, and cod can be cooked in a variety of ways; as such, these fish, all of which you can find here, are versatile enough to pair up with whatever type of beverage you’re in the mood to drink. Flavor, texture, and ultimately how you’re preparing your fish are all going to help you select a drink that is your meal’s perfect match. Sure, you could wash down your wild salmon dinner with a pint of pilsner and feel perfectly content, but you’d be missing out on the full potential that salmon has to pair up with beer. As a fatty fish with bold flavor and hearty texture, wild salmon can hold up to more pronounced beers. 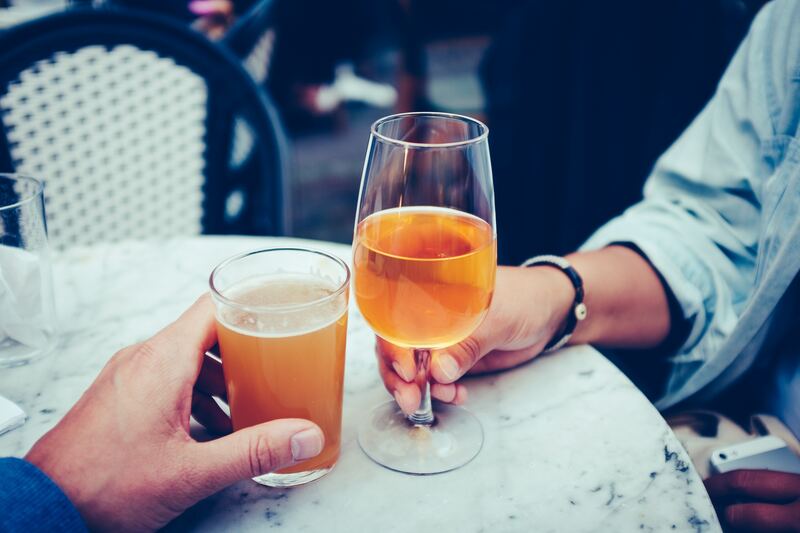 Try a cold saison to balance out a fillet of smoked salmon; the zesty, flavorful notes of the beer will be a nice foil to the richer, deeper notes in the salmon. For salmon cooked more delicately, white beers with hints of lemon rind are smooth and refreshing accompaniment to your dish. Wild salmon gives you lots of options when it comes to wine pairing. Think fuller-bodied white wines. If your salmon dish is made up of classic fish-friendly components like fresh herbs, lemon, and garlic (and even a splash of white wine), try pairing it with an unoaked chardonnay from Burgundy. You can’t go wrong with a rosé either. That said, don’t be afraid to pair salmon with red wine, as it can stand up to both light- and medium-bodied red wines — especially if you’re giving it a less delicate treatment. A bright pinot noir from the Pacific Northwest would be the perfect accompaniment to a grilled salmon steak. If you’re smoking or curing your salmon for a cocktail party, bust out your martini glasses — a classic gin or vodka martini is an excellent accompaniment to the saltiness of salmon hors d’oeuvres, whether the martini is served with olives, cucumbers, or a twist of lemon. For those of your guests who aren’t drinking alcohol, an icy cucumber mint lemonade is a refreshing choice against the salty, savory salmon snacks. Wild Alaskan halibut is a flaky white fish with a delicate flavor and low fat content. Since it’s not as meaty as salmon, you’ll want to stray toward more moderate or even delicate beverage pairings. If you’re using your halibut in a flavorful cioppino or bouillabaisse, serve it up with a cold pint of pilsner. The crispness of the beer will be a refreshing contrast from the heat of the dish, and the subtle flavors of the beer won’t compete with every delicious thing you have going on in your stewpot. Halibut, however you cook it, pairs up well with white wines. An aromatic vermentino or a fuller-bodied riesling (the dry kind) are excellent options, depending on the flavor profile of your dish — the former for milder preparations, and the latter for spicier, fuller dishes. Red wine with white fish? It can absolutely be done. A lighter red wine, especially one that can be chilled a few degrees, is an appropriate pairing for halibut. If you have access to a good wine shop, look for a Sicilian nerello mascalese to serve with your salmon; the tart balance of acidity in this grape will have you convinced that white fish dishes and red wine are not necessarily a faux pas. Halibut makes for excellent fish tacos, in which case margaritas are a no-brainer. Feel free to stray from the classic margarita by adding in components like jalapeño, blood orange, or mango depending on what accoutrements you’re using to dress your tacos. Aguas frescas can stand in as a mocktail: simply blend ripe fruit like watermelon or pineapple with water, lime juice, and simple syrup to sweeten if needed. Cod is halibut’s gentler little brother: it’s a smaller white fish with more delicate texture. Because they are both mild in flavor, you could pair cod with some of the same libations as halibut; however, the techniques you’ll be using to cook cod are going to dictate what works best for this catch. A proper fish and chips can be made with wild Alaskan cod. A pale ale would be a proper choice in beer. The effervescence will help to cut the fried goodness of the dish and, as opposed to a lighter beer, the moderate hops and malt of a pale ale round out some of the dish’s flavors. For a romantic dinner for two, olive-oil-and-herb poached cod, luscious in texture, marries perfectly with a glass of sauvignon blanc from anywhere in the world. You can fine-tune your selection by matching up the herbal profile of your dish to the dominant flavors of each sauvignon blanc region: New Zealand blanc’s, for example, tend to have tropical notes, while Californian bottles might err on the sweeter side. ,French ones will have citrusy and even grassy characteristics. If you’re really craving a glass of red wine with your cod, try it out with a chilled barbera. This acidic grape is low in tannins, which means it will enhance the flavors of your dish without interfering with the texture of the cod. Daring home chefs might even want to serve cod with a red wine reduction. A French 75, made with gin, champagne, lemon, and sugar, makes for an elegant cocktail to pair with pan-fried cod in a lemon-caper sauce. While champagne on its own might detract from the delicate nature of cod, a champagne-based cocktail mellows out some of the effervescence of the beverage so that it can share the stage with your meal. If you can get your hands on lemon verbena, use it to make a batch of herbed simple syrup which you can use to gussy up a mocktail of sparkling lemonade.